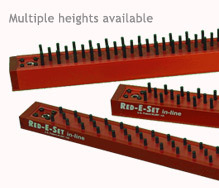 The Red-E-Set ML (Manual Lock) units work with most inline Screen Printers, Dispensers, Placement machines and Chipshooters. In some cases it can also work with semi-automatic machines (see Semi for more info). High number of support points provides maximum support on all boards. Maximum support for single and double sided boards. Independently spring loaded, ESD safe, non-abrasive pins. Pins lock in place to fit boards contour and for repeat usage. Both mechanical and electric versions.